Perfect combination of scrolls designed as an upper and lower focal point, using vertical bars to tie the seven sections of this entry door, side lights, and upper arch window together. 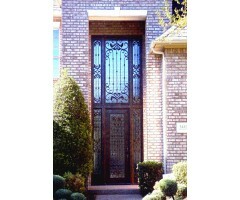 The use of privacy glass allows those inside and out to enjoy the beauty of the ironwork. .. 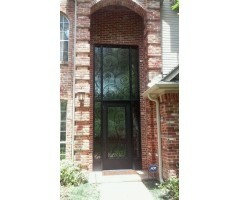 The vast amount of glass on this grand entrance was a wonderful canvas to create a work of art. We layed out a beautiful border pattern using a scrolled center and end pieces on each of the six sections, placing four collars on each to add a visual draw like that of a necklace. The double entry door and the upper window was dressed in a flowing relaxed scroll design which offered a wonderful welcome to the home. .. 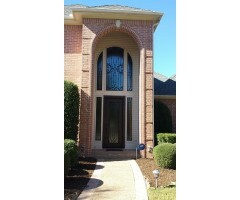 This arched double door was created with artistic finesse! The detail on this door is amazing, starting with the solid panels at the bottom of the door leading upward to the delectable cluster of twisted forged leaves interwoven with the scrolls leading the eye upward through the vertical bar to each of the perfectly placed round collars to end in the peak of the arch to beautiful gold tipped leaf clustered scrolls. .. 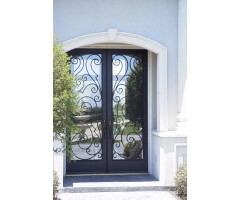 Double iron doors using privacy glass and dressed up with a classic center medallian design, and a larger scale to compliment on the side windows. .. 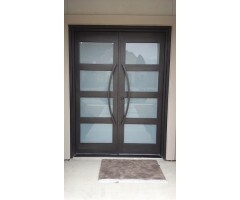 This double iron door was created for a contemporary home with it's frosted glass in uniform spacing, and finished with the long sweeping door handles. .. 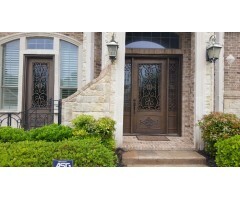 The single iron door was built for this beautiful 6 section arched entrance. The ironwork on each of the windows surrounding the door were designed to compliment eachother to make a big impact on this home. .. 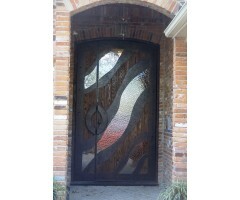 This unique artistic oversized door incorporating iron, wood, and glass was designed to compliment the custom floors on this home. It was built with a pivot system verses a hinge system. .. 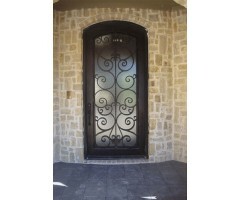 This large entry door and upper window is filled with a scrolled design making a beautiful work of art for the front entryway .. Custom design on the main entry door & side windows including a secondary door to the left adding tremendous architectural value to this home. Finished in a dark bronze, these doors and windows were built with a solid panel on the lower portion with a centered decorative detail. .. The contrast and elegance of the design on this double entry door in the satin black finish against the exterior pastel color scheme on the home is stunning. .. 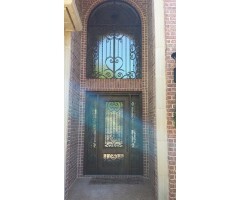 The custom ironwork on the door and window inserts created an extremely impressive entrance to this home adding architectural grace and value. .. The beautiful large scrolls show beautifully from the street with the frosted obscured glass behind on this front entry door. ..